ISUOG surveys its international membership base annually to stay up-to-date on member interests and demographics. Read more about our latest survey results. Thank you to everyone who participated in the 2018 annual membership survey! We received a record 2145 responses, which will enable us to improve ISUOG in accordance with key areas that are important to you. Thank you for helping us shape ISUOG! Most respondents to the 2018 survey were Basic members (31.00%). Most were relatively new to ISUOG, being a member for two years or less and most respondents had first connected to the Society through an ISUOG event (30.27%) or the World Congress (19.09%). 49.25% of respondents who had answered that they were Basic or Lapsed members answered that they read free access UOG articles, and 20.68% of this group answered that they used institutional access. 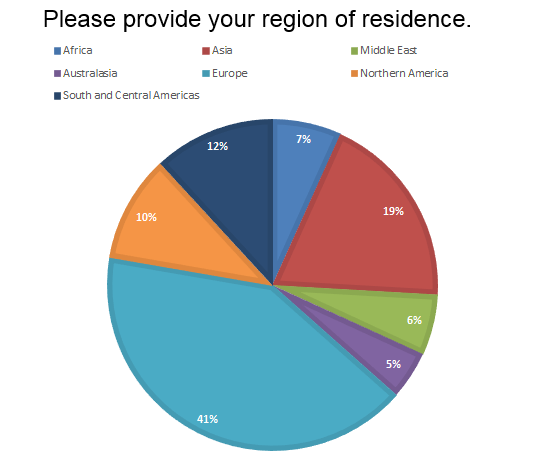 We are also happy to have diversity in respondents from different regions. Most respondents were from Europe (41.15%), with large proportions of respondents from Asia (19.15%) and South and Central Americas (11.87%). Our respondents’ main reasons for being a part of ISUOG are to assist their professional development, to have access to educational material online and to access lectures from Congress. 40.1% of respondents visit our website at least once a month, and 32.89% of respondents visit our website at least once a week. 70.97% of respondents would welcome additional calculators. 93.82% of respondents intended to renew their membership. The main reasons for not renewing were price (34.21%) and that the member only became a member from an event they attended (23.68%). 96.27% of respondents would recommend ISUOG to a friend or colleague. Become an ISUOG member for access to exclusive ISUOG membership benefits.